A regional publisher has remembered newspaper staff who died in the First World War ahead of the 100th anniversary of the conflict’s end. Archant has paid tribute to the men of the Norfolk News Company, which later became its forerunner Eastern Counties Newspapers, who perished in the war. The company’s Great War roll of honour lists the names of seven men who died in the four-year conflict. Alfred Walter Boatwright, William Arthur Cook, Noel Herbert Freeman, Ernest Paul Murton, George Secker, Charles Leonard Tench and Reginald A.W. Tillett all died between 1915 and 1917, serving in France, Belgium, Malta and Turkey. William Arthur Cook, an advertising representative for the Eastern Daily Press, was also killed in action on 23 November 1915, aged 30. 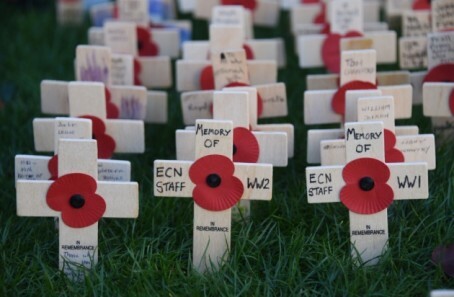 Now Archant employee Chris Amos – who spent 24 years in the Royal Military Police and completed tours in Afghanistan, Iraq and Northern Ireland – has placed a wooden-backed poppy in Norwich Cathedral’s Field of Remembrance, set up as part of a campaign run by the EDP, in their honour. He also placed a poppy in memory of staff who died in the Second World War. Chris, a project manager of the Archant Local Recall archive project, said: “There would have been so many people who would have been impacted by the war.